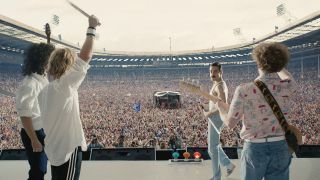 Queen video director Rudi Dolezal says the a follow-up film is "being heavily discussed in the Queen family"
Rudi Dolezal, a video director who worked with Queen on videos including These Are the Days of Our Lives, The Show Must Go On, Innuendo and The Miracle, has said that manager Jim Beach is considering a sequel to the Oscar-winning Bohemian Rhapsody movie. “I’m sure he plans a sequel that starts with Live Aid.” Dolezal told Page Six, before adding that the follow-up film is now “being heavily discussed in the Queen family." The band have made no official comment about a follow-up film, although ABC will be launching The Show Must Go On: The Queen & Adam Lambert Story in April. It’s reported that the documentary will explore the Lambert's career from his early days, through his time as a competitor on American Idol, through to joining up with Queen. Queen and Lambert opened the Oscars ceremony in Los Angeles last month with a medley containing We Will Rock You and We Are The Champions. Bohemian Rhapsody went on to clinch four Oscars on the night. Bohemian Rhapsody is now the biggest music biopic of all-time and, prior to the Oscar success, had won two Golden Globes and two BAFTAS. Queen and Lambert will head out on the Rhapsody tour across North America this summer.